Tally enjoying a good scratch to get rid of that winter hair! Still on the banged-up list, from my domino impression earlier this week, my only horse activities have involved carrots and curry combs (the latter at least is constructive, being smack in the middle of shedding season). But Spring has clearly sprung, and with it comes thoughts of riding across miles of beautiful country. Yet, it is becoming increasingly obvious that this most enjoyable equestrian occupation is being missed by the majority of riders! I know that some of you hack out (or trail ride, if you prefer) because I have read about it. So, let me start by saying: Good for you! Keep it up! And … I am jealous! For most of my riding life, hacking out was a regular activity. I started riding rental horses on trail rides with my mother. Even after starting lessons, weekends were spent guiding others on trail rides. Riding out was such a favorite activity, that for many years it was our chosen way of celebrating Christmas! 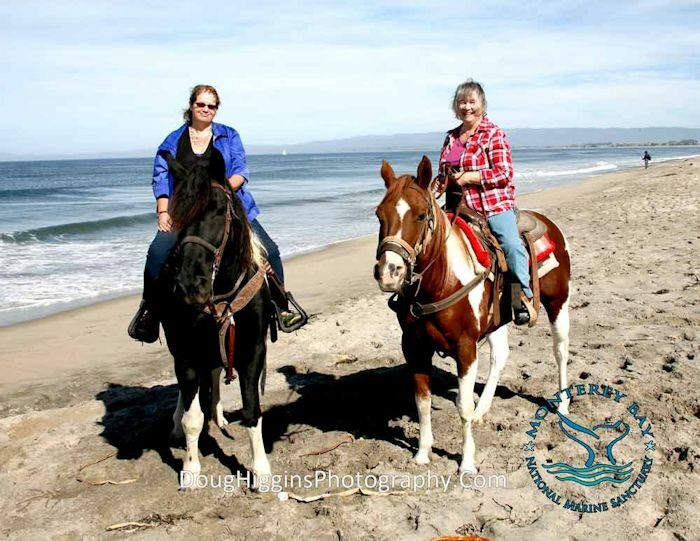 Lacking our own pair of sane, sound, trail worthy horses, we rented a pair for my mom’s 75th birthday celebration. Until we moved to this property, our horses were always housed in farm country. Across the street, or just a short walk away, we could access miles of levies lacing their way through all manner of crops. At least a couple of days a week, and sometimes even after an arena workout, everyone got time to mosey down these trails. There was always something new to see or hear. Horse and rider alike seemed to enjoy the excursions. Dani was the only exception, in those days. Riding Dani out was like riding some enormous snake! She was not badly behaved on the trail, but she was the ultimate tourist. First looking left, her body bowing right as she craned to take in all the sights. Then, something on the right would catch her attention, and we’d drift left. Back to looking left and … you get the picture. When you are walking six feet above the field on one side, and a flowing waterway on the other, this is not the most comfortable experience! So, her hacking was limited to the track around the back of the property and through the cross country field. But even she only “worked” three days a week – the rest of the time was galloping, trail obstacles, hacking and jumping. And it’s just that variety that today’s horses (and riders) seem to be missing out on. Becoming a more common sight in the Dressage arena than ever before. The more I look around, the more I see horses and riders limited to doing the “chosen” activity day in and day out. One blogger that I follow only ever refers to her time in the arena. She struggles with a volatile horse, and I can’t help but think that a lot of that is due to his limited lifestyle. 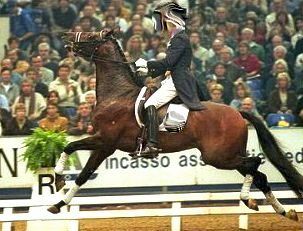 In fact, Dressage horses in general have become known for being volatile. I first became aware of this when buying boots for Tally. 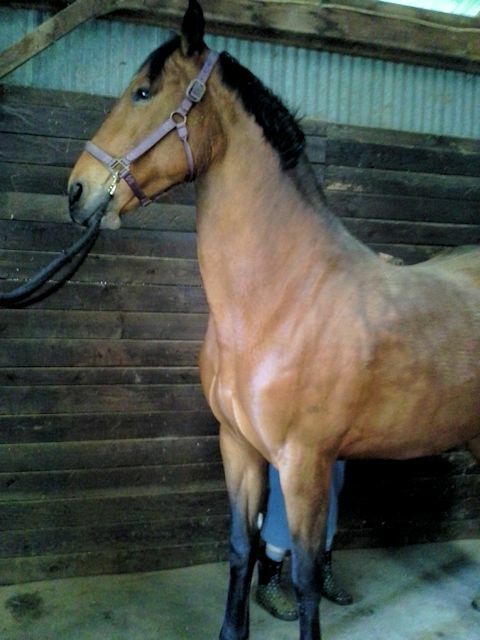 The girl at the store asked me what I did with my mare, and when I said she was intended as a Dressage horse, her response was: “Oh, then she must be very hot and spooky!” At the time, I was taken aback that anyone would have that opinion of Dressage horses – now I understand the reaction better. Back in the day when Dressage horses were well rounded and calm. See the bottom of this post for the “who’s who” in this photo. you see light, fine blooded horses – yet, they could parade as a group through an awards ceremony with nary an ear flicker between them. It was not their breeding that gave them that calm attentiveness – most of those horses had previously led other lives. Read the histories of those horses, and you’ll find that many were trained for other occupations before they were “discovered” for Dressage. In addition, the trainers of those horses believed in starting their young horses by spending six months to a year just riding them out in groups across the country. Many of them were taught to jump, even if that was not their main career. Contrast that to most of today’s Dressage barns. A couple of years ago, Dressage Today featured an article about the Peters’ decision to have all of their top horses go barefoot. In that article it was stated that their horses live in stalls with shavings and are worked in arenas with good footing. 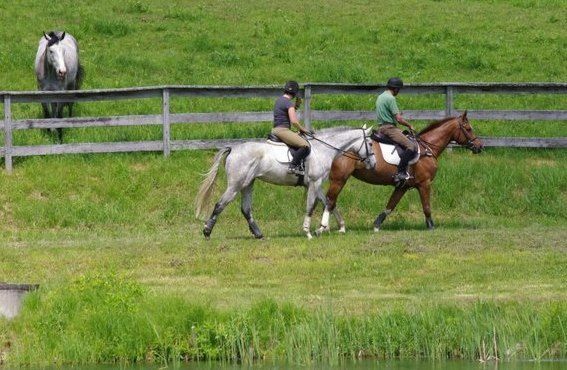 Mrs. Peters’ idea of “varied terrain” is “They’re hand-walked on pea gravel, turned out on sand and they graze on grass.” My first thought, upon reading that, was “How sad!” Not to pick on them – this seems to be the norm for Dressage and Hunter/Jumper horses, these days. 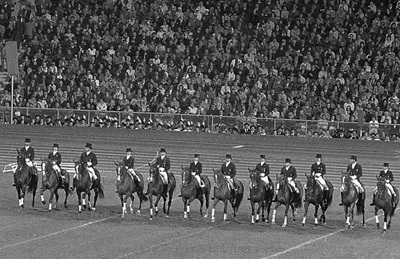 With a few notable exceptions (Carl Hester, Uta Graf and Ingrid Klimke), life for horse and rider seems centered on the arena. One of Denny’s hacking pictures that make me so jealous! Denny Emerson still starts all of his young horses (which don’t get started until 4, by the way) with a year of walking through the hills of Vermont and North Carolina. I see the pictures he posts, and I confess to being completely jealous! Here we sit, on a small property, landlocked by other houses and busy roadways. Hacking out for us means hauling somewhere. Since I hate trailering as much as my horses hate being hauled, we have had a long drought from hacking out. Predictably, I have a barn full of homebodies who don’t like going away from home (with the sole exception of Coffee, who is always stellar when we take him for walks down the road). We try to compensate for the lack of hacking out by adding as much variety as possible, getting out of the arena when we can – but it’s just not the same. So, that is our big goal for this year – to get everyone on the road, even if just for long walks. If you already take your horse out, keep it up! If you spend all of your time in the arena, then join me in resolving to get out and about. Worried about your horse? Then take them on hand-walks until you both get more comfortable. The more you get out, the more relaxed you’ll both get. Then you can enjoy the greatest pleasure of having horses – getting back to the nature we both came from! This entry was posted in My Journey, Thinking Out Loud and tagged arena bound, arena sour, back to nature, Denny Emerson, Dressage, explosive horses, hacking, landlocked, Spring. Bookmark the permalink. 4 Responses to Do you hack? My mare is getting a lot of flat walking. VERY easy trail walking. Whish it had some more hills, but it’s still good. Not thoroughly by choice right now – she’s just not mature enough for any serious amounts of arena work. One can only hope. .. When I started Dani, all those years ago, that’s just the kind of program I followed. Then, when I did start arena work, it was with the intent of selling her as a hunter, so it was all long-frame work. When I started serious Dressage work, nearly two years later, she was the most “error free” horse I’ve ever trained. So, in my book, you’re on the right track! Wait. And then you ended up keeping her? Yes, Elinor, I had her until her death at age 25. She was my dancer … not much more than a thought and I could get piaffe, canter pirouette or half-pass. She taught me what it could really be like to dance with your horse!